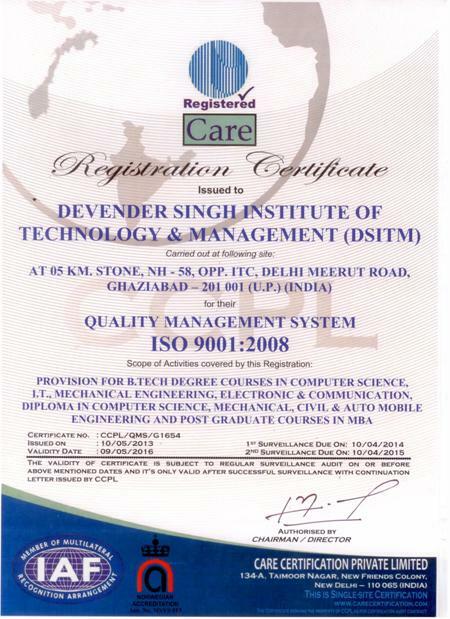 The DSITM emerged from the trust Devender Singh Educational Trust, Ghaziabad, is an autonomous, self-supporting institution starting with session 2008-09 with seed support from the AICTE, New Delhi and Mahamaya Technical University, Noida ( formerly Uttar Pradesh Technical University Lucknow (UPTU)). A major goal of DSITM is to impart a uniquely broad and interdisciplinary technical education of the highest academic quality. This is achieved through an integrated curriculum that consists of a highly diverse set of technical courses, interdisciplinary technical research projects, day-to-day interaction with industry, and preparation in entrepreneurship and personality development courses. To train and educate the undergraduate students of outstanding ability who can become leaders in the Technical industry and profession. To provide with excellent infrastructure and faculty with technologies and their societal, scientific, industrial and financial applications. To work closely with the industry leaders through their Corporate Schools and to help them in undertaking training programmes needed in the industrial and financial sectors. 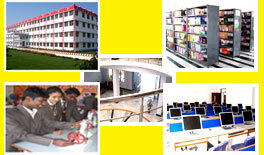 DSITM setup in a campus of more than 10 acres. Away from the noise the Institute is Located in Ghaziabad, 0.5 km stone on Delhi -Meerut Road NH-58 Opp. International Tobacco Company (ITC). The Institute combines the freedom of an academic institution with the strength of the societal values. It enjoys the location advantage is being in the city and the availability of all kinds of public transport.